Pictured above are participants of the 2012 Summer Training Academy for Research in the Sciences (STARS) program and Medical Scientist Training Program (MSTP), as well as UC San Diego graduate advocates. Next summer, undergraduates from Howard University will participate in STARS as part of the UC San Diego/Howard University partnership program. 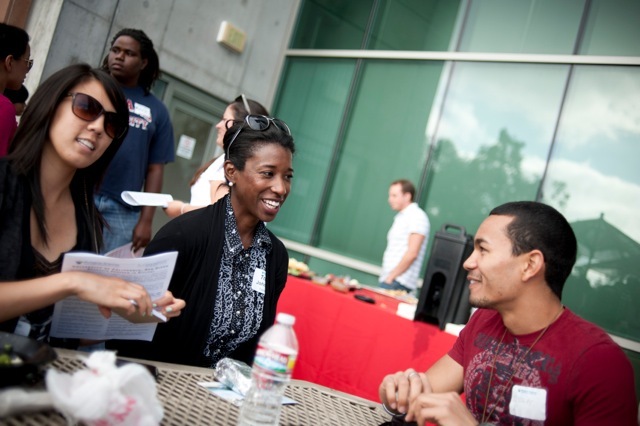 UC San Diego and Howard University are forming a partnership program aimed at increasing the number of African-American applicants to UC San Diego graduate programs, particularly in the fields of science and engineering. 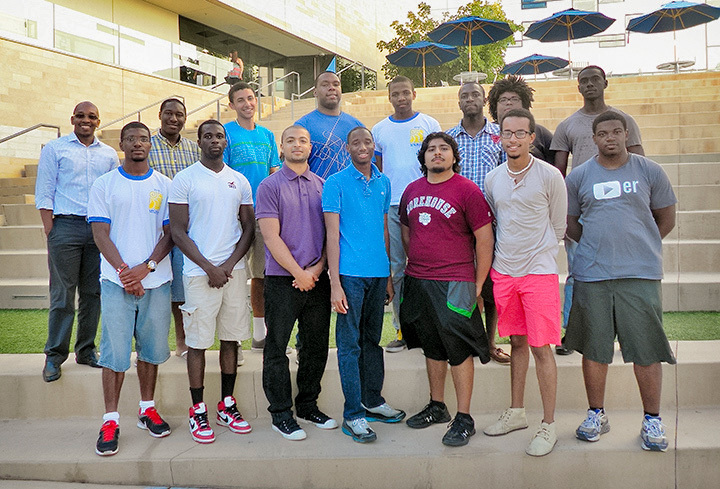 Supported by a $288,000 grant from the University of California Office of the President, the UC San Diego/Howard University Partnership for Graduate Student Success will provide Howard undergraduates with an intensive summer research experience at the La Jolla campus, as well as mentorship from UC San Diego faculty throughout the academic year. In addition, program participants who apply and are admitted to a University of California graduate program will have their student fees covered by UC. Representatives of UC San Diego’s Chapter of the Edward Alexander Bouchet Graduate Honor Society participated in the Puente 9th Grade Student Leadership Conference held Dec. 1 on the UC San Diego campus. The Puente Project provides support and guidance for economically disadvantaged and underrepresented students to enroll in four-year colleges and universities. Puente serves these high school students through writing support, counseling, and mentoring, encouraging them to graduate from college and return to their community as mentors and leaders. The conference, which takes place twice a year, hosts 900 Southern California high school students and 100 chaperones and parents. During the conference, students attend keynote speeches, workshops, and panels. Bouchet Society members Maiya Murphy, Nick Saenz, Ty Samo, and James G. Williams conducted two workshops on opportunities in graduate education. The workshops concluded with question-and-answer sessions, encouraging the students to envision how graduate education might be relevant to their futures. The grant award is part of the University of California-Historically Black Colleges and Universities Initiative (UC-HBCU). The goal of the initiative is to improve the representation of African Americans in UC graduate programs, particularly Ph.D. programs, by investing in relationships and efforts between UC faculty and historically black colleges and universities. Currently, African Americans are the most underrepresented group at the graduate level in relation to their U.S. population, averaging 2.5 percent of UC’s doctoral enrollment from 2006 to 2010. Tracy Johnson, associate professor of molecular biology and co-principal investigator on the grant. The UC San Diego/Howard University Partnership for Graduate Student Success will leverage UC San Diego’s existing Summer Training Academy for Research in the Sciences (STARS) to provide an eight-week mentored summer research experience for up to 10 Howard University students each year. When the students return to Howard, they will continue to engage with UC San Diego faculty mentors and graduate student mentors—including participating in online lab meetings—through Skype and other online tools. By fostering a sustained relationship between the two universities, the program hopes to prepare and encourage more Howard undergraduates to pursue research and advanced degrees, especially at UC San Diego. For more information about the campus’s partnership with Howard University, visit the Pathways to UC San Diego website at pathways.ucsd.edu.